SUMMARY: Gradient-echo (GE) imaging is recognized as a means to detect hemorrhagic changes in cerebral amyloid angiopathy (CAA). However, almost 25% of patients with CAA do not show microhemorrhages on T2* GE imaging. We applied a new imaging method, susceptibility weighted imaging (SWI), to evaluate the presence of microhemorrhages. In a suspected case of CAA, where cognitive effects are also present, we show that SWI is much more sensitive in detecting microhemorrhages than conventional methods. Susceptibility-weighted imaging (SWI) is a new imaging method that maximizes sensitivity to magnetic susceptibility effects1,2 and is clinically useful for evaluating trauma and vascular malformations.3,4 However, the role of SWI in other neuropathology has not been extensively evaluated. SWI is more sensitive than conventional gradient-echo (GE) techniques for the detection of blood products.4 Because GE imaging is a well-recognized method of detecting changes indicative of cerebral amyloid angiopathy (CAA),5–8 SWI should be successful as well. This is the first reported evaluation of SWI in a patient with suspected CAA showing marked increased sensitivity to the detection of microhemorrhages compared with conventional GE sequences. A 70-year-old man with a past medical history notable for diabetes, hypertension, and ischemic heart disease was referred for evaluation of recurrent cerebral hemorrhages. The patient had experienced a left temporoparietal cerebral hemorrhage approximately 10 years before presentation. Six months before arrival at our hospital, the patient presented with speech difficulty; subsequent brain MR showed a 3.1 × 2.7-cm left temporooccipital lobe hemorrhage with a small zone of surrounding edema. Two months before presentation, the patient underwent coronary artery stent placement and was placed on aspirin and clopidogrel. Within a week, he presented with altered mental status, and a CT without contrast showed a new 3.0 × 2.5-cm intraparenchymal hemorrhage in the left posterior temporoparietal lobe. Because of recurrent hemorrhages in the same location, diagnostic considerations included vascular malformation and amyloid angiopathy. Before MR imaging, the patient underwent cerebral angiography, which demonstrated no evidence of arteriovenous malformation or any pathologic vascular condition. MR angiography (MRA) showed similar negative findings. Brain MR demonstrated encephalomalacia within the left temporoparietal lobe, consistent with the patient’s history of prior repeated hemorrhages. GE and SWI images showed low signal intensity within the left temporoparietal lobe region, consistent with hemosiderin deposition. 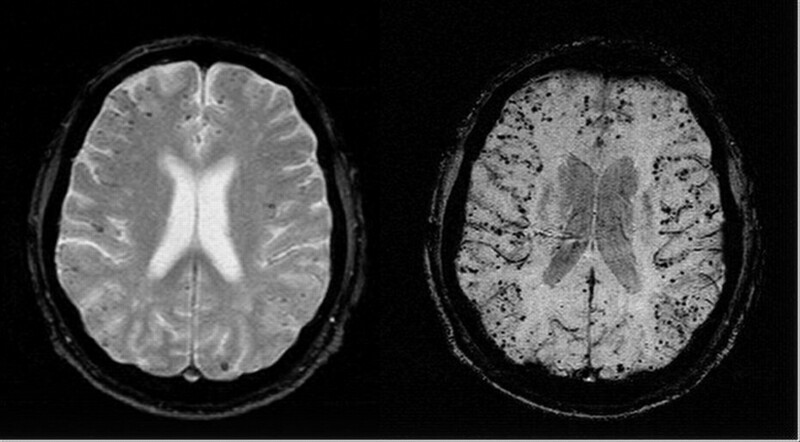 Both the T2*-weighted GE (Fig 1, left) and SWI image (Fig 1, right) show multiple low-signal intensity areas in a cortical-subcortical distribution, consistent with hemosiderin deposition. However, SWI shows the susceptible foci to be both more numerous and with improved apparent contrast compared with the corresponding conventional GE image. Using the same criteria for counting the small rounded lesions, the SWI projected image shows 201 lesions, whereas the GE-projected image shows 74 lesions. Aggregate imaging findings are consistent with old infarct and highly suggestive of CAA. Axial gradient-echo T2*-weighted image (left; 800/26 ms [TR/TE], 5-mm section thickness, Nx = 256, Ny = 154) shows some low-signal-intensity foci associated with CAA. Corresponding SWI image (right; 85/35 ms [TR/TE], α = 20°, Nx = 512, Ny = 256, with a resolution of 0.5 mm × 0.5 mm × 2.0 mm, projected over 8 mm) shows many more associated low-signal-intensity foci. SWI is a 3D, velocity-compensated, GE sequence that combines both magnitude information (used in conventional MR images, including T2* GE) with phase information to accentuate the visibility of susceptible foci (such as small veins and hemorrhage). Microhemorrhages contain hemosiderin, which is paramagnetic relative to normal tissue and leads to large variations in local magnetic fields and a local reduction in T2*. The signal intensity loss is proportional to the amount of hemosiderin present. SWI, with its unique sensitivity to blood products and hemorrhage,2,3 is well-suited to detect imaging changes consistent with CAA as evidenced in Fig 1. SWI imaging, in this case, detected far more microhemorrhages than the conventional T2* GE technique. Conventional T2* techniques underestimate microhemorrhages compared with autopsy, and only 75% of patients with amyloid and lobar hemorrhages show microhemorrhages on T2*-weighted sequences. SWI is a much more sensitive technique than conventional T2* imaging, making it an important method of improving initial diagnosis. Increased sensitivity may allow assessment of the rate of microhemorrhage development or regression, allowing more precise analysis of the natural history of the disease, or assessing response to therapy. Early recognition can be advantageous to patients on anticoagulant or aspirin therapy in that they are at increased risk for subsequent and possibly fatal hemorrhage (reported to be as high as 38%, with a 44% mortality rate).11 In our case, antithrombotic agents were discontinued because the risk of hemorrhage was determined to be greater for this patient than the risk of thromboembolic disease. Strict blood pressure control may also be of utility in patients with CAA-related hemorrhage. This work was supported in part by grants from the National Institutes of Health HL62983 and AG20948, Siemens Medical Solutions, and the State of Michigan Grant 085P5200251. Accepted after revision January 16, 2006.